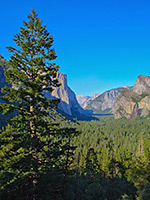 Two roads lead up Yosemite Valley for 20 miles and form part of an extensive one-way system; the Southside Drive eastwards and the Northside Drive westwards. They wind through flat woodland and flower-filled meadows with occasional named viewpoints, past picnic spots and short paths to and along the Merced River, always in the shadow of the 3,000 foot tall granite cliffs on either side. Development is concentrated along the last 3 miles of the roads, which pass carparks, campgrounds, shops, hotels and many other buildings - see east valley map. 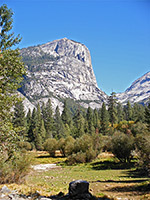 Most accommodation needs to be booked many months in advance, but for campers at least, there are other, less crowded options in several official sites in the forests outside the valley, along the approach roads - at Wawona, Bridalveil Creek (along the Glacier Point Road), Crane Flat, Hogdon Meadow and various sites along the Tioga Road. 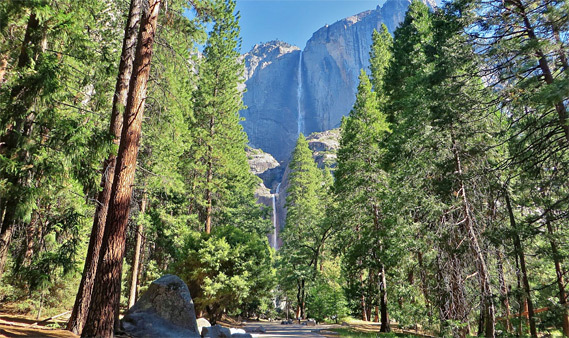 The valley offers over a dozen trails, for hikes ranging from 20 minutes (Bridalveil Fall) to all day. where the road emerges to the incomparable Tunnel View, a vista of the Merced River framed by the massive cliff face of El Capitan on the left and graceful Bridalveil Fall to the right. Driving further east, the cliffs to the south soon become near vertical as the road descends towards the river and passes two trails - the long Pohono Trail to Glacier Point and the short path to 620 foot Bridalveil Fall, a seasonal waterfall flowing from a U-shaped hanging valley high above the main gorge. Just after is the start of the one-way section of Southside Drive, at a junction with a connecting road to the north. El Capitan comes fully into view as the highway rounds the edge of Cathedral Rock; this 3,000 foot high block of granite is the most famous cliff in Yosemite National Park, dominating the western approaches. El Capitan is a world-renowned rock climbing location, and depending on the route, an ascent might take several days, so climbers sometimes have to camp overnight on the face while securely fastened to narrow ledges. After a second crossover road to the north, the Southside Drive reaches two riverside picnic areas at Cathedral Beach and Sentinel Beach, then passes through a meadow and enters the congested east end of the valley. The main section of the road ends at Curry Village, which has lodging, several shops, restaurants, cycle rentals and other services. This is where the northside highway heads back west, though public roads do extend 0.8 miles further east, to the main camping areas (Upper Pines, Lower Pines, North Pines) and the Happy Isles Nature Center beside the Merced River, from where starts the well-traveled John Muir Trail to Vernal Fall, Nevada Fall and many places far beyond. Also near Curry Village is one of the two main parking areas in the east valley - Trailhead Parking, for hikers bound for the John Muir Trail or Tenaya Canyon (including Mirror Lake and Mirror Meadow). Roadside viewpoints hereabouts afford views of Half Dome, a peak which rivals El Capitan as a symbol of Yosemite; this huge domed granite mountain, 8,800 feet high, was cut in two by glacial activity 1 to 2 million years ago leaving a 2,200 foot cliff with the steepest vertical grade in the USA. The Northside Drive crosses Ahwahnee Meadow and enters Yosemite Village, where most of the visitor services are found, including the main day use parking area - apart from here and the trailhead parking, in the easternmost 3 miles of the valley cars may only be left elsewhere if using paid facilities - lodges, campgrounds, stables, etc. Instead, the NPS operate a fleet of free, wheelchair-accessible shuttle buses that stop at 21 places, next to all important locations. The principal buildings at Yosemite Village are the main park visitor center, a bookshop, museum, store, post office, wilderness center, the Ansel Adams Gallery and the Ahwahnee, a grand, historic hotel. One service not available anywhere in Yosemite Valley is gasoline; for this, the closest stations are at Wawona, El Portal (the most expensive), Crane Flat and Tuolumne Meadows. 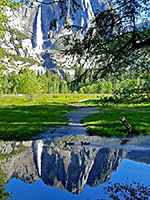 South of the village is a nice short hike across Cook's Meadow, one of the few large treeless areas in the east valley, so a good spot for taking photographs, but it gets far fewer visitors than two trails starting a short distance east, which lead to Upper and Lower Yosemite Falls. 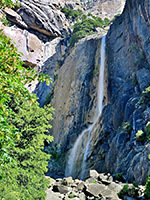 The Lower Fall is the most visited landmark in the valley - here Yosemite Creek tumbles 320 feet onto a jumble of boulders, while far above, the Upper Fall forms a spectacular white vertical cascade, visible for many miles. In between the two Yosemite Falls trailheads sits the venerable Yosemite Lodge at the Falls, providing accommodation since 1916. This marks the last of the built up area, as beyond the Northside Drive enters mixed pine woods and grasslands for 2.5 miles back to the foot of El Capitan, and a layby that provides the main viewpoint for those gazing up at the cliff. Neighboring El Capitan Meadow usually sees many people looking through binoculars, hoping to spot climbers high above. At the edge of the mountain, Ribbon Fall is the seventh highest waterfall in the world, with a drop of 1,610 feet, though the water flows only during peak snow melt times in spring. The cliffs further west become steadily less sheer as the road passes several picnic areas and river access points, before a junction at the end of the valley - CA 120 north to Big Oak Flat & the Tioga Road, and CA 140 west to El Portal & Mariposa.